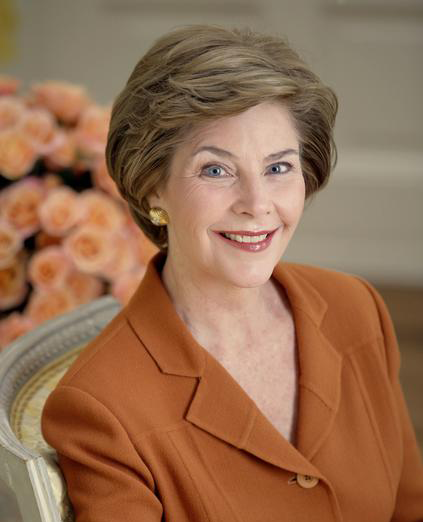 Former First Lady Laura Bush, a speaker at Global Summit VI. Looking over the speaker list for this year's summit at the Jefferson Educational Society, I'm struck by its diversity. There's thematic diversity – fans of contemporary poetry have something to get excited about, and fans of Shark Week do, too. There's cultural diversity – we'll take a look at indigenous life prior to Columbus, we'll consider the changing role of women in government, and we'll hear from two of the most prominent African American voices in politics. Finally, there's a diverse array of specialists – urban development experts, Catholic nuns, marine biologists, seasoned journalists, and two high-profile First Ladies. All of this diversity is deliberate. According to Ferki Ferati, the Jefferson's Vice President and Executive Director, the summit's goal is "to explore new ideas. To explore what is going on globally in multiple fields – not just politics, not just technology, not just history. We're supposed to look at the world and bring some of the best minds into Erie to generate discussion." Journalist Charles C. Mann kicks things off with two different lectures – one on Nov. 4 about pre-Columbian society, and one on the 5th about the history of aspirin. How's that for diversity? The week's events conclude on November 12 when Dr. Gregory Skomal alerts us to the ecological crises facing the Great White Shark. If the array of topics seems overwhelming, there's no need to worry. We've organized a handy guide to each night's content featuring: the skinny, why the savvy have these folks on their radars, and why we think they're worth seeing. 11.4 // The Jefferson Educational Society // 7:30 p.m. The skinny: Mann, a widely respected journalist and a natural storyteller, has authored two books about indigenous history in what would become the "New World." The first, 1491: New Revelations of the Americas Before Columbus, earned him the National Academies Communication Award in 2006. The follow-up, 1492: Uncovering the New World Columbus Created, was applauded by the New York Times for managing "the difficult trick of telling a complicated story in engaging and clear prose while refusing to reduce its ambiguities to slogans." On radars because: Mann reveals an astounding display of recent discoveries about pre-Columbian life, from fields as varied as archeology, ecology, agriculture, and history. And he explains the data in down-to-earth terms, avoiding boring jargon and tech talk. Worth seeing because: Mann's books systematically undermine our preconceptions about Native American life with credible, contemporary evidence. I was always suspicious of the "Indian" stories I heard at school in the '80s, but until I read 1491, I had no idea how deeply misguided my preconceptions were. You'll have plenty to talk about on the ride home. The skinny: When he's not righting the wrongs of Eurocentrism, Mann is also known for his science journalism. With Marl L. Plummer, he co-authored The Aspirin Wars: Money, Medicine, and 100 Years of Rampant Drug Company Competition, which tells the extraordinary story of our most ordinary medication. According to the Kirkus Review, the book is a "well-told tale of greed, business acumen, and ongoing marketing genius that's also a microcosmic history of law, politics, and medical progress in the 20th century." On radars because: Discoveries about the medicinal properties of aspirin are apparently ongoing. And the mechanics that propel the pharmaceutical industry are always of interest in our age of endless quarreling about health care. Some historical perspective may be in order. Worth seeing because: Mann has a knack for finding amusing, informative details. Did you know that aspirin was one of the first drugs not to be sold by its chemical name? Another early pioneer in this regard was heroin! 11.5 // The Jefferson Educational Society // 7:30 p.m. The skinny: In our literary landscape of bloated "Young Adult" sections, poetry struggles to maintain relevance. Stephen Burt wants to change that, and make us re-think our fear of – or indifference to – this endangered literary medium. He argues that the rhythms, metaphors, and emotions in poems can surprise and energize us in a world that gorges itself on blog comments and Twitter updates. On radars because: As a literary critic, Burt is known for his voracious appetite for new content. He's as interested in the avant-garde rhetoric of a '70s-era Language poet as he is in a graphic novel at the comic shop. He's also written extensively about gender non-conformity, science fiction, and women's basketball. His enthusiasm for each of these subjects is contagious. Worth seeing because: As you might imagine, Burt isn't your typical Ivy League academic. Did I mention that he's also delivered TED talks, created indie-pop zines, and written movie reviews in the voice of X-Men characters? 11.6 // The Jefferson Educational Society // 7:30 p.m. The skinny: Bruce J. Katz is a man with an impressive résumé. He's the Vice President of the Brookings Institution, an influential, non-partisan think tank focused primarily on economics and community development. As Founding Director of the Brookings Metropolitan Policy Program, he meets with community leaders to find practical solutions to public policy problems. In the early days of the Obama Administration, he served as senior adviser to the Secretary of Housing and Urban Development during the crucial first hundred days of our current president's tenure. On radars because: Katz is a big champion of what he calls "metropolitan prosperity," and at the summit, he'll share ways to achieve it in Erie. Expect well-informed suggestions about infrastructure improvements, incentives to encourage innovation, and strategies to make the Gem City more vibrant and prosperous. Worth seeing because: We're all sick of abandoned storefronts and empty parking lots. And we all share a stake in the future of our city. 11.7 // The Bayfront Convention Center // 7:30 p.m. The skinny: Chittister is no ordinary religious leader. She's more interested in social justice and gender equality than fire-and-brimstone moralizing. As co-chair of the U.N.'s Global Peace Initiative for Women, she examines the psychological and spiritual causes of human suffering. Chittister approaches her Catholic faith from an activist's perspective, working tirelessly to promote opportunities for women, pacifism, environmental awareness, and common ground between different faith communities. At the summit, she'll address the issue of active citizenship – encouraging us to play a more active role in the collective well-being of the people around us. On radars because: How many nuns can you think of that moonlight as Huffington Post columnists? Worth seeing because: Chittister is incredibly active in the local community. With the Benedictine Sisters of Erie, she provides food to the needy at the Emmaus Soup Kitchen and arts instruction at the Neighborhood Art House on 10th Street. She's also the executive director of Benetvision, a research center that examines the role of spiritual practices in the 21st century. She's an animator as well, and she uses her digital skills to promote inner growth through the web-based Monasteries of the Heart. 11.10 // Cathedral Preparatory School // 7:30 p.m. The skinny: From opposite ends of the political spectrum, Brazile and Steele have emerged as two of the most influential voices in American politics. At the summit, they'll tackle three of the most important – and contentious – issues in our society. Expect Brazile to approach the topics from a liberal perspective and expect Steele to make the conservative case. Expect both to make a nuanced argument based on years of high-level experience in Washington. On radars because: Between 2009 and 2011, during a time of great political gain for the Republican Party, Steele served as chairman of the Republican National Committee. He was the first African-American to do so. In 1999, Brazile served as Al Gore's campaign manager during his contentious bid to win the 2000 election. Doing so made her the first African-American to lead a major political campaign. In a political landscape still dominated by old white guys, they are sure to offer illuminating perspectives. Worth seeing because: Issues like income inequality, immigration, and access to health care affect all of us. Though we're used to a lot of partisan bickering about these subjects, neither Brazile nor Steele is known for anger or bombast. I doubt they'll find common ground on these issues, but I'm sure the conversation will be gracious and stimulating. 11.11 // Bayfront Convention Center // 7:30 p.m. The skinny: Two former First Ladies take center stage to consider the unique challenges women face in the political sphere. Despite lip service about gender equality, less than a fifth of our current members of Congress are women. As Republicans, Bush and Ridge represent a party that has struggled with female voters in recent years. Some have even argued that their party is waging a "war on women." Expect Ridge and Bush to address these challenges and propose practical solutions. On radars because: When summarizing an event about gender equality, focusing on the participants' husbands is never a good idea. So I'll assume you know who they are already. But did you also know that Bush currently serves as the leader of the Helping America's Youth initiative, which encourages young people to avoid the dangers of drug abuse and violence? Or that Ridge served as chair of the Governor's Community Partnership for Safe Children during her husband's administration? And they also share an interest in library science. Ridge earned her master's in the subject from the University of Pittsburgh, and Bush earned hers at the University of Texas. Worth seeing because: Obviously, both speakers have intimate knowledge about the challenges that attend a life in politics. Their time in the spotlight has undoubtedly generated some hard-earned wisdom. 11.12 // Jefferson Educational Society // 7:30 p.m. The skinny: Skomal is an accomplished marine biologist who uses satellite-based technology and acoustic telemetry – a sound tracking process that helps to determine travel and behavior patterns – to monitor the behavior of sharks. He's also extremely interested in the ecosystems they inhabit and the challenges they face. On radars because: Unless you're intimately familiar with our oceans' ecosystems, you'll probably recognize Skomal from Shark Week. His work has been featured in Discovery Channel specials like "Jaws Comes Home," and he's a familiar face to viewers of ESPN and National Geographic as well. Worth seeing because: When I asked Ferki Ferati (of the Jefferson) about this event, he explained its significance very effectively: "It's estimated that humans kill about 100 million sharks per year. One-hundred million. And most of them are just used for their fins. They cut off their fins to make soup, and they throw the rest of the shark back into the ocean. And according to (Skomal), it's catching up to us."